Do you remember the French Blue edition of the Air Jordan 12 that won the hearts of many sneaker-lovers in 2004? The Jordan Brand wants to try its charisma once again with the release of the new colourway of the Air Jordan CMFT Max Air 12 today, 5 February. The White/Metallic Silver-French Blue edition of the Air Jordan CMFT Max Air 12 is expected to attract more buyers today with its famous design and colourway, which have been tried and tested in the different Jordan shoes that made waves in the market. Featuring a white upper part that is accented with French Blue lining, midsole, and lateral base panel, the new edition of the Jordan CMFT Max Air 12 is must buy this weekend and your surely regret it if you don’t buy one! 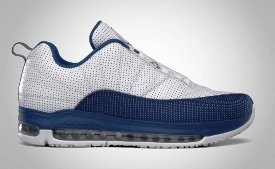 First Installment of Jordan CMFT 11 Viz Air This Year Coming Out!